Secondary teachers can access Autodesk lesson plans and project-based learning materials to educate and inspire students. 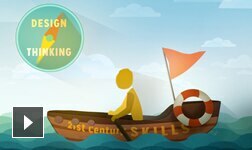 The Digital STEAM Workshop uses a Design Thinking approach together with project-based lesson content to inspire students to be creative thinkers and innovative problem solvers and promotes the development of 21st Century skills that can support further education and design-based careers. Autodesk Digital STEAM projects enable you to bring creativity into the classroom and inspire your students to become active participants in their own learning. Each project includes a video that introduces a challenge and positions it in a real-world scenario. Project materials also include an accompanying instructor guide and a designer guide that includes step-by-step instructions. Find a Digital STEAM Workshop design project for any level of experience. Learn how to master Digital STEAM challenges with this free, 2-hour online workshop. Encourage your students to start designing today, and display their work in the Digital STEAM gallery. *Free Autodesk software and/or cloud-based services are subject to acceptance of and compliance with the terms and conditions of the software license agreement or terms of service that accompany such software or cloud-based services. Software and cloud-based services provided without charge to Education Community members may be used solely for purposes directly related to learning, teaching, training, research or development and shall not be used for commercial, professional, or any other for-profit purposes.